Why is this so?, you may ask. Heres a simple answer Because most of the newbies, especially when they get started with Internet Marketing, dive right into it without equiping themselves with the education necessary for them to succeed. Hence, a lot of them suffered from heavy losses and give up eventually. However, if you are equipped with the right education, and follow proven step-by-step strategies, then you can almost be sure that you will be able to generate a healthy profit on the Internet Provided you take action to work on what you have learned on a consistent basis (by this, I mean you should spend at least 1 to 2 hours on it every single day). Another question that is commonly asked is What is the quickest way for me to generate a massive amount of cash on the Internet? While there is no single formula that guarantees you will be able to generate a massive amount of cash in a short period of time, there is one that guarantees that you will start generating profits within a short period of time. Quick Profit Mode is a 49-page ebook where you will discover how you can generate an average of $100 every single day using a simple 5-step system. Each of these 5-step system in Quick Profit Mode is very comprehensively documented, and the whole ebook is written in simple English, so as to make it extremely understandable (even if English is not your first language). 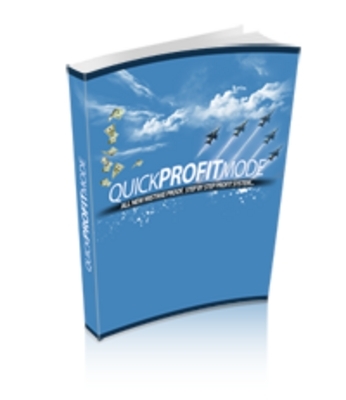 In the Quick Profit Mode guide, you will find more details on how you can carry out each and every step in this proven 5-step system. Facebook Advertising 101 - Creating Facebook Ads That Work!